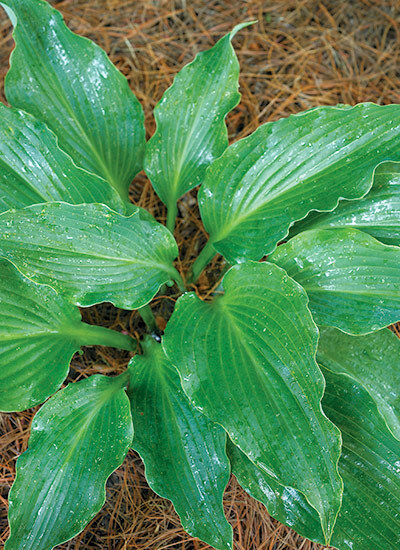 Find the best hostas for your garden with Garden Gate’s 12 top hostas. 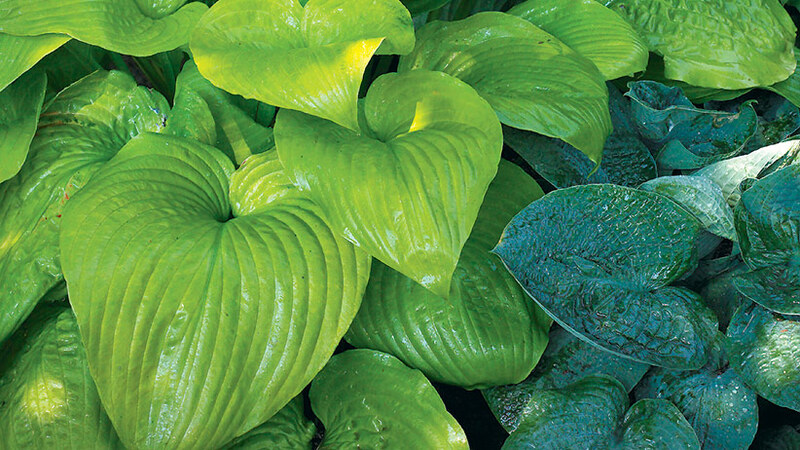 Hostas are shade garden classics. 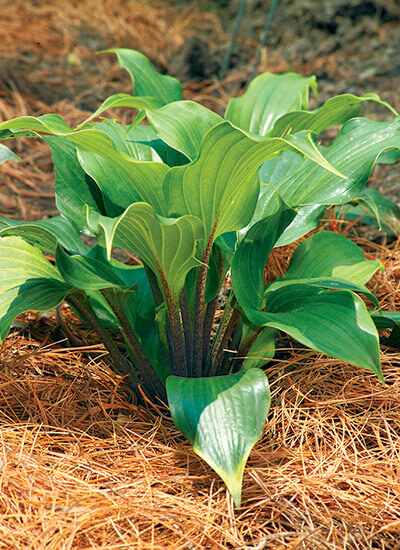 These easy-to-grow perennials come in a variety of colors, sizes and shapes but how to you choose the best hostas? We can help! Undemanding and cold-hardy from zones 3 to 8, hostas look best when grown in well-drained soil and part shade, though there are some exceptions that don’t mind more sun. Though hostas do bloom in late spring through late summer with pale lavender or white flowers, foliage is their main attraction. 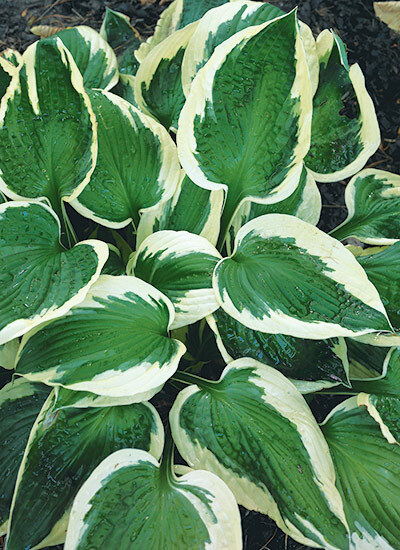 But don’t think you can’t have color — hostas come in shades of blue, gold or green, including many with variegated leaves. Try pairing a cool blue hosta with burgundy coral bells (Heuchera hybrids) in your relaxing backyard retreat. 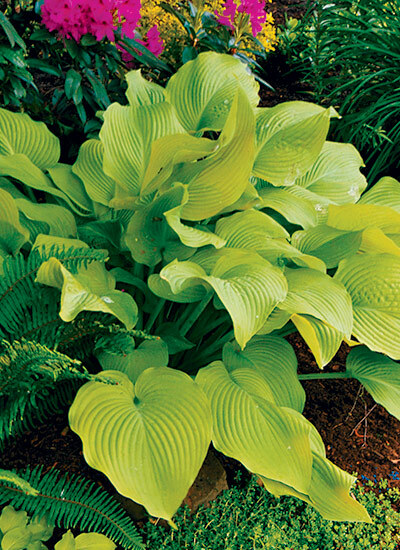 Or replace the blue hosta with a chartreuse one for eye-popping results. Colorful leaves are exciting, but leaf shape and size are a plus in the garden, too. 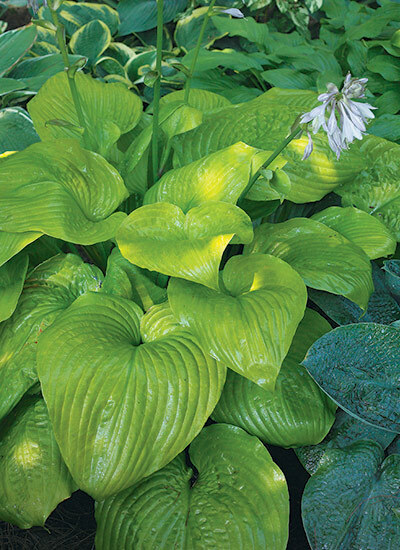 Most hostas have heart-shaped or round leaves, but you’ll also find some that are very narrow, others that are cupshaped and yet others with wavy edges. So even hostas that are the same color keep the garden lively with different leaf shapes and sizes. You might notice that younger hostas look a little different than the “grownups.” For example, a young ‘Halcyon’ has lance-shaped leaves, but in a few years, they’ll be heart-shaped. A large hosta like ‘Sum and Substance’ makes people stop and say, “Wow!” It’s a great background for smaller plants or a gorgeous specimen. On the other hand, smaller hostas look great edging a path. 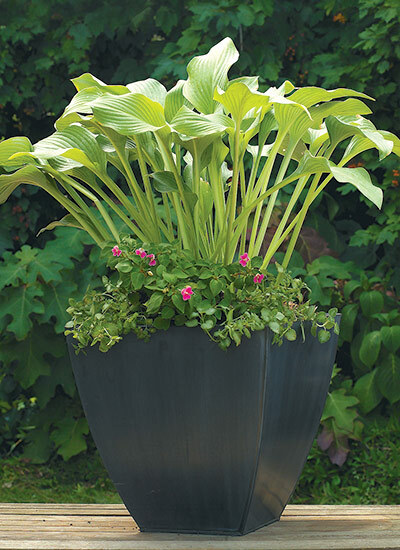 But even a miniature hosta like ‘Blue Mouse Ears’ can be the center of attention in a container. So with all this variety to choose from, where do you begin? 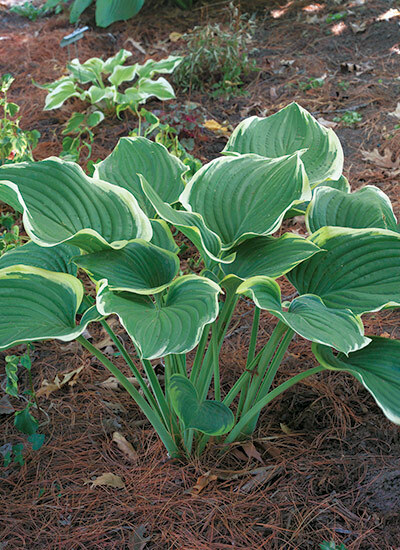 Start with an outstanding hosta. There are hundreds available, and most are good choices. But these 12 solid performers are some of our favorites. Sometimes bigger really is better. Try this supersized hosta. Such a big plant can hold its own even with shade-garden shrubs like hydrangeas. Deeply veined leaves start out light green, change to chartreuse, and then turn golden yellow as the weather warms up. The more morning sun you can give your ‘Sum and Substance’, the brighter gold it will be. In shadier gardens, leaves are greener. Patience is a virtue with this hosta — it can take 5 years or more to reach mature size, so make sure you get this gentle giant right where you want it, then sit back and enjoy. ‘Halcyon’ is one of the best blue hostas you can grow. 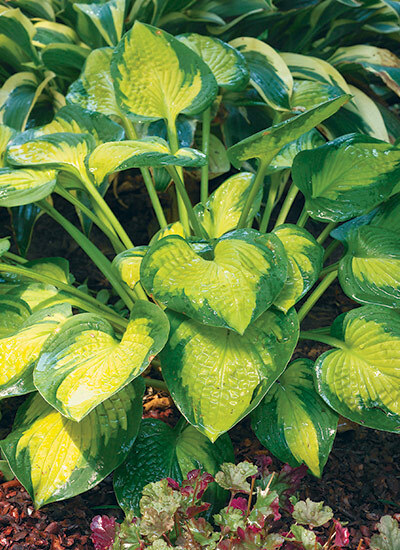 Heart-shaped leaves have prominent veins that swoop down the leaf from stem to tip for a simple, sophisticated-looking hosta. Rub a blue hosta leaf with your thumb and forefinger and you’ll notice some of the blue disappearing. This is called the “bloom.” It’s a waxy coating that can be washed away by heavy rain or burned off by too much sun, leaving a green leaf. Don’t worry, though. Next year the leaves will be blue again. That’s why blue hostas are better off in more shade than their green or gold cousins. Sometimes a plain-green hosta is just what you need. But why go with just any green hosta when you can have ‘Cutting Edge’? Those wavy leaves have what’s called a “piecrust edge.” With age, the leaves become wavier, and edges curl up to reveal the dusty blue back of the leaf. Mature plants form a dense mound of undulating leaves that create a sense of movement in the garden. And if you like hosta flowers, you can extend your season with the late blooms of ‘Cutting Edge’. ‘Little Sunspot’ has thick leaves with a deep-green margin that widens as the plant gets older. And puckering on the leaves — sometimes known as “seersuckering” — gives an interesting texture up close. Morning sun will turn the center brilliant gold in the North, but full shade is better in hot Southern gardens. Small hostas are always a good choice for the front of the border, but ‘Little Sunspot’ adds some extra punch with its beautiful variegation. And it multiplies quickly so you’ll have plenty for the edge of a path or containers. Big, beautiful ‘Sagae’ is one of the earliest hostas to emerge in spring. Leaf margins unfurl bright yellow and turn creamy by midsummer. When planting a young ‘Sagae’ like the one in this photo, remember to give it plenty of room. If you have several plants and want a grouping that isn’t overcrowded, plant them 5 feet apart on center. You’ll need some patience, though, because like many large varieties, ‘Sagae’ is slow to reach its mature size. This hosta was formerly known as Hosta fluctuans ‘Variegated’ so you might see it listed that way occasionally. Most hostas have showy leaves but in the case of ‘One Man’s Treasure’, it’s the stems that are the star. As you can see in the photo, the stems are covered in red-purple spots up to the leaf blade. 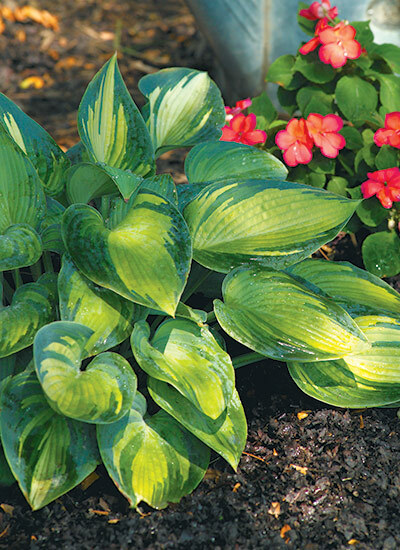 This hosta is the perfect candidate for planting on a terraced area where you can fully appreciate the colorful stems as you go by. ‘One Man’s Treasure’ grows in an open, arching mound with bell-shaped violet flowers on even darker stems. If you leave the scapes, or flower stems, on the plant, purple seed pods will form. You’ll never get bored with this beautiful hosta. In spring, leaf centers are chartreuse then change to a creamy yellow by summer. The color varies depending on the amount of light available. In fact, in full shade the center stays chartreuse and the blue margins fade. You’ll get the best color by growing ‘June’ in morning sun and afternoon shade. And those beautiful leaves are thick, so slugs go looking elsewhere for dinner. With its smaller size, ‘June’ is an excellent choice to grow in containers. And because it’s quick to multiply, there will be plenty for both the garden and the patio. Add sparkle to your shade garden with ‘Patriot’. The irregular bright-white margins really stand out. Up close, you’ll notice splashes of gray-green where the white margin overlaps the green center. ‘Patriot’ is a good choice for gardens where summers get hot — it can take the heat and still look good. A couple inches of mulch and regular watering will be a big help. Don’t be discouraged if you don’t see the violet-tinged new shoots of ‘Patriot’ coming up right away. This hosta is slower to emerge in spring than other varieties. Mini hostas are a growing trend, and ‘Blue Mouse Ears’ is one of the best. Tiny but mighty, this little dynamo has thick bluegreen leaves that form a tight mound. (Thick leaves are a big plus for any hosta because slugs seem to pass them up for more appetizing fare.) This diminutive shade plant is perfect for edging a path. Or make it the highlight of a mini garden like the one here. Growing with a dwarf mugo pine and a peperomia, ‘Blue Mouse Ears’ is part of a charming tabletop display for a patio in part shade. Watch for the flowers in summer — they swell up like tiny balloons before they open. The vaselike habit of ‘Krossa Regal’ makes it a standout in the world of hostas. Rising upward rather than out, it brings an architectural element to the garden. This upright habit also makes ‘Krossa Regal’ a great choice for containers — there’s room below for more plants! Add a splash of color with impatiens and lamium like we’ve done in the photo above. 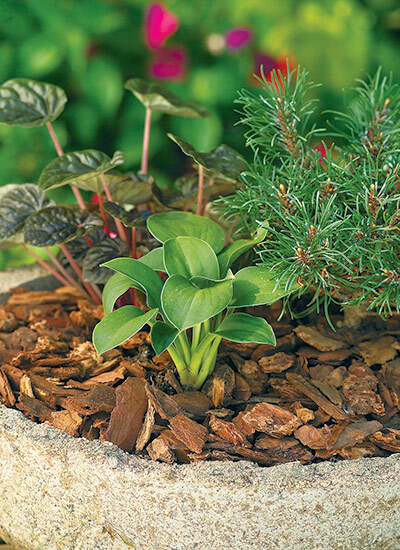 For happy, healthy hostas on your patio, use a container with drainage holes and a soilless potting mix to help prevent root rot. Water regularly, especially during summer. Since watering washes nutrients away, sprinkle a slowrelease fertilizer on the surface of the potting medium. Flecks, streaks and marbling are out-of-the-ordinary markings for hostas, so it’s no surprise ‘Revolution’ is popular. This is a vigorous hosta that will come back year after year. 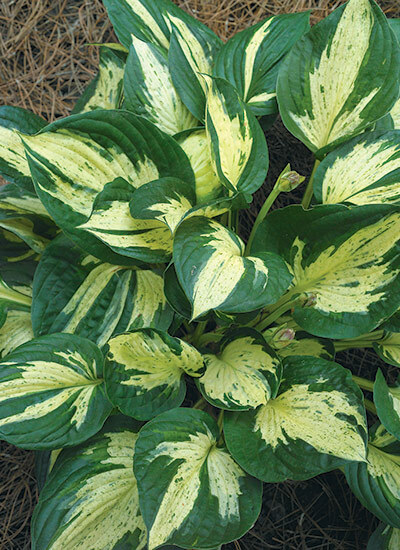 (Some hostas with this type of variegation can be short-lived.) Thick leaves form a nice upright mound with confettilike flecks on a creamy center. The flecks start out pale in spring but grow darker as the season progresses. Placing ‘Revolution’ where it gets morning sun will bring out the best leaf color, but in the South, full shade is your best bet. 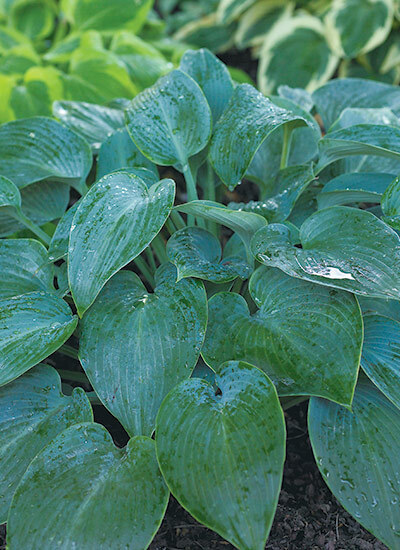 As you would guess by the name, ‘Sun Power’ is a hosta that doesn’t need much shade. Make sure it gets at least 2 hours of sun for the best color. ‘Sun Power’ can even take full sun in all but the hottest areas. Ruffled leaves emerge chartreuse in the spring and rapidly change to gold. The more sun you give your ‘Sun Power’, the more water you’ll need to provide to avoid the crispy edges that hostas may develop in summer. A couple inches of mulch can help soil hold on to moisture so you don’t need to water quite so often.